It’s fun when one of our regular clients comes into the store and tells us they have a special project that they want to work on. This projected happened to be a revamping of a playground structurein their backyard with a bit of a treehouse component. At Clancy’s Rainbow, we are always up for the challenges that our clients give us, whether it is choosing the perfect pink for your baby girls bedroom or the darkest navy for your home theatre or colours for your outdoor playground structures, we are here to help bring colour into your life. You can imagine the fun our design team had with this particular project: making a children’s playground a little bit more grown up - a tween makeover. By adding great little touches like tire seating, shelving nooks and playful games stencilled onto the platform, these tweens are bound to enjoy their new outdoor play space. Our client is the creative DIY blogger Shelly from 100 things 2 Do. She came into our store with pictures and ideas of what she wanted to do to update the playground structure. Sections were going to be added and expanded. A reading nook area was going to be created and decorated with a few recycled objects. Some projects were already completed as she used paint to transform these items. Shelly wanted to add a bit of fun and whimsy to the playground and our team was happy to collaborate . 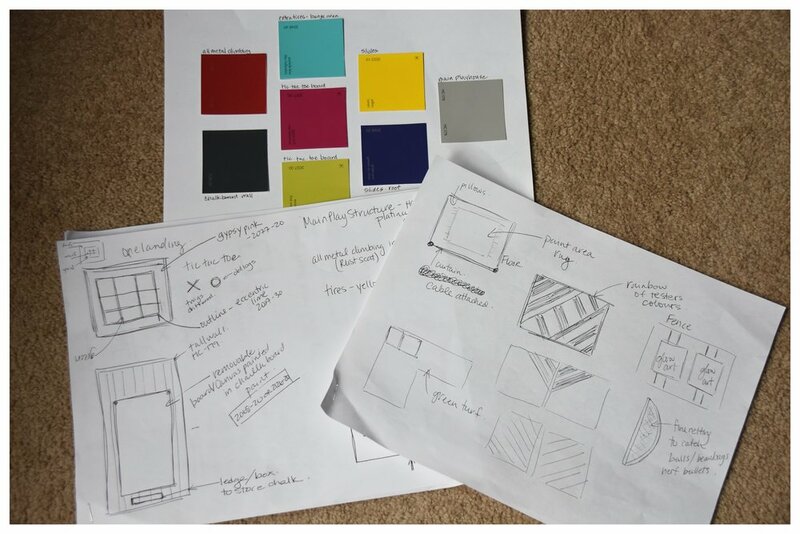 Once we understood the overall vision for the project, the design team came up with a few suggestions of colours and patterns that she could incorporate. If you need any help choosing colours or you need a little help with a design. Come into our store located at 1030 Adelaide Street North and our new location (coming soon) on Wonderland Road North, in London, Ontario. We will be happy to help with your design dream..
With March in full swing, we are approaching home selling season. When you ask a real estate agent what is the best time to sell your home, they will always tell you that the spring and fall are the ideal times. Because both of these seasons are times for transition, we tend to be more motivated to sell and BUY during these times. Whether we want a close date that will get your family settled for the summer season to take advantage of the pool or you want to get settled to have the trimmings up before the holidays, these two times of the year which are the most popular. If you are considering selling your home this spring, you may want to tackle a few projects before putting your house up for sale. We found a great checklist from Realtor.cathat we thought would be useful to find out if your home is ready to be listed. You can print it out and go through, in addition, we have a few suggestions about what you can do to be List ready. General Maintenance – after the winter months, this is a good time to look around to see what needs fixing. Maybe tightening the screws on the door handles or kitchen cabinets, fixing a leaky faucet or checking for the seals on your windows. Though these may seem like minor repairs (e.g. : filling in chips in your wall), buyers take notice on the overall maintenance of your property. If they feel that you’ve taken care of it, they are more confident that they are buying a quality home. De-cluttering and de-personalizing – if you are planning to sell, you need to make the house less about you and more about the new owners. Get rid of the clutter and take down family pictures. You want the new buyers to picture themselves in the house making their own memories. Declutter the big important rooms like the kitchen, bathroom and basement. Clear the cupboards of excess ‘stuff’ so they your buyer can see how much room they have to store their stuff. Rent Storage Space- Getting rid of books on shelves, extra toys in the playroom or empty the contents of the garage if you use it for storage. Create space in your home. If buyers come to your house, they should be able to walk around without bumping into furniture. So if you have to do some editing without getting rid of a prized family heirloom, you may want to rent a storage unit. The benefit is that you will do a bit of packing before the big move day comes along. Deep clean – make sure to wipe down all the walls (especially in the kitchen). Don’t neglect cleaning and painting behind your refrigerator and stove. This is where your house can show age. It may seem silly but if it has not been clean recently, the buyers may feel that the house has not been taken care of. Use TSP to clean the walls thoroughly before repainting the walls. A coat of Fresh Start primer can also seal in stains and odours that linger. Paint, Paint, Paint – a fresh coat of paint in high traffic areas makes a great first impression. Keep the colour scheme neutral. You my have loved your French Violet (CC-960) in the bathroom but the new owners may want something white and slick. – remember, this isn’t going to be your home much longer! Painting can also be one of the most cost effectives ways of making a dramatic change. You can’t replace all the windows? Lighten up the area with Simply White OC-117 or Ice Mist OC-67. Consider Curb appeal: What your front door looks like is important. You want it to be welcoming and appealing. We recently wrote a blog post about how to choose the correct colour for your front door. Landscaping and colourful container planters always make your home look like it is well cared for and loved. Fill flower boxes and containers with beautiful flowers and greenery. Review the exterior paint: garage doors, window frames, light fixtures and shutters or trim. These can all be painted to give your home a new ‘facelift’. “Choosing the right paint colour is a critical decision, but it doesn’t have to be intimidating,” said Andrea Magno, Benjamin Moore Colour & Design Expert. “We develop our colour forecasts, advice and colour tools with a designer’s eye to ensure that consumers and professionals alike can access and navigate our collection of more than 3,500 colors with ease.” Magno shares three simple tips to improveany colour confidence.